Former Labor party leader and new head of Jewish Agency bids farewell to the Knesset after 15 years of service. 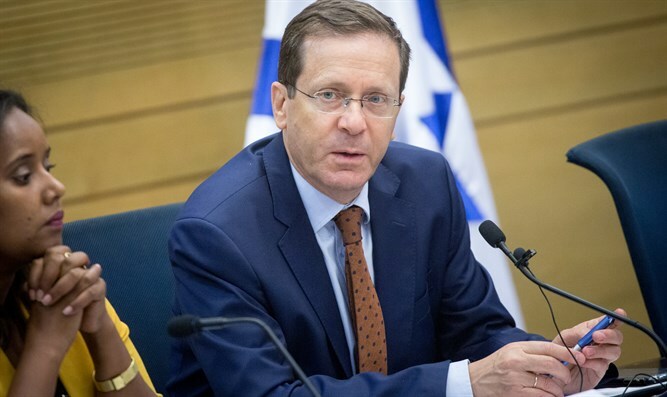 Opposition leader MK Yitzhak Herzog (Zionist Union) left the Knesset on Wednesday after serving 15 years as Labor Party chairman. In about two weeks, Herzog will take up his new post as chairman of the Jewish Agency, replacing the prisoner of Zion and Israel Prize laureate Natan Sharansky. At the Knesset event, dozens of invitees, Knesset members, ministers and advisors, who wished to congratulate Herzog for his new position, took part and parted from the Knesset. Herzog's staff helped him pack his belongings in the Knesset. Outside his office, boxes were stacked on top of each other, waiting to be transferred to his new office in the Jewish Agency. Education Minister and Chairman of the Jewish Home party , Naftali Bennett, twrote on Twitter: "We have just said goodbye to Herzog and it was exciting to see how MKs from all over the world came from love to the man. The task of 'Boujie' and myself (as Minister of the Diaspora) is no less fateful: To save world Jewry from assimilation and disappearance. MK Rachel Fadida of the Zionist Union told Herzog, "Your contribution to Israeli democracy, and particularly to the Labor Party, will be felt for many years to come. Thank you."